Peter Dreidoppel founds the company and begins with the manufacturing of flavours. Peter Dreidoppel develops new and individual methods for the manufacturing of flavours. They gain full success. Until today they are the basic principle of our company. 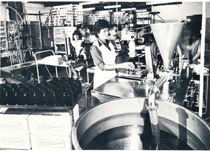 The basis for our extraordinary flavour "Citroperl" is made. Until today this product is unique and stands for the high Dreidoppel quality. The new building in Langenfeld is ready. Our Gelatop Ice Cream Paste Vanilla is launched first time. Until today this product is the market leader for Vanilla ice cream in Germany. Our in-house, perfectly equipped baking studio opens. Receipt of DIN ISO 9001 certification for quality. Our Gelatop Forum is built. Since that day it is used for seminars, trainings and product trials. Certification according to the International Food Standard (IFS), take-over by Ireks GmbH, Kulmbach. The newly built, state-of-the-art production complex is completed and starts with new production possibilities. Dreidoppel grows further, new properties are bought for new offices and storage options. The land area doubles.